Are you looking for a plastic surgeon in Southern California? This surgeon might just be your perfect fit. 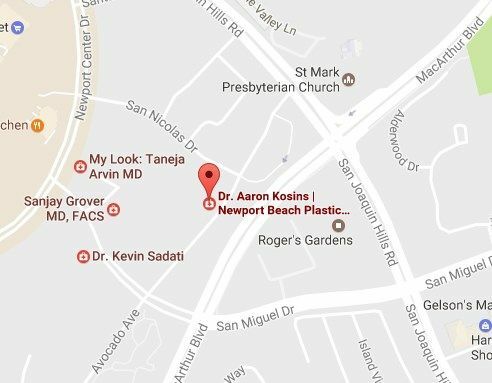 Dr. Aaron Kosins holds a dual Medical Degree (M.D.) and a Masters degree in Business Administration (MBA) in Entrepreneurship. He is a highly-credentialed expert on skin care, cosmetic dermatology, plastic and cosmetic surgery, and medical aesthetics. He is also highly regarded for his expertise in Rhinoplasty and Breast & Body Contouring and frequently attends prestigious conferences around the world to speak about new techniques and technologies. In addition to operating a thriving surgical practice in Newport Beach, California, Dr. Kosins has trained extensively with acclaimed skincare pioneer, Dr. Zein Obagi, and is a co-owner of ZO Skin Centre at Fashion Island, Newport Beach. Dr. Kosins sat down with VIVA GLAM for an in-depth interview regarding the dos and don’t of plastic surgery, the rumors, non-invasive treatments, and much more. I chose to become a Plastic Surgeon because when I was a student, the Plastic Surgeons did the most incredible surgeries I had ever seen. During the first surgery I ever watched, there was a patient that had a cancer of his jaw bone. After it was removed, the guy had almost no jaw. Then, I watched the surgeons transfer a patient’s leg bone to become a part of their jaw! I thought How cool was that? I want to be able to do that. When women choose a plastic surgeon what are the key essentials to know? You are known as one of the best there is in the field of the so called “nose job”. While the excellent ones can not even be spotted, we see way too many bad ones or ones that leaves the face more symmetrical, but also more boring with no edge. What’s important about getting the right nose job and what is unique about your approach? Two new things about my approach that are unique are Piezosurgery and the treatment of patients with difficult skin. I no longer “break” my patients’ bones. Piezosurgery is an existing technology that we have just now started to use in rhinoplasty. Small saws are used that cut bone but not skin. So I can move a patient’s bones (to narrow or straighten the nose) without trauma. This is more accurate and causes less swelling and bruising. Also, this year I have been giving a lot of lectures on treating people who have thick and oily skin. These patients often get suboptimal results because the skin acts like a thick blanket and little definition can be seen. Using creams and sometimes medication, I have been able to shrink the soft tissue/skin of the nose and this has been proven with ultrasound. Both of these things are totally new and exciting to offer to my patients. I am not a fan of this for a few reasons. First, the nose is full of blood vessels, and in the wrong hands, filler can cause whole subunits of the nose to turn black and die! At every rhinoplasty meeting I go to, there are lectures on how to deal with filler complications. Also, filler is soft and the nose consists of bone and cartilage. he unique definition of the nose can’t really be achieved by injecting soft, gelatinous material. Even in the best hands these procedures need to be repeated 2-3 times per year. If you think about this, it is extremely expensive over time with suboptimal results. Because of this, I have NEVER put filler in the nose. In fact, I am seeing a whole new group of patients who need surgical rhinoplasty after having bad “non-surgical” or filler rhinoplasty. I have to melt the filler (if possible) before surgery or remove it during surgery before I can create the ideal nose. We see a great push for non-surgical procedures to tighten skin. Some claim that it makes surgery obsolete. What is your take on it? In general, I just don’t buy it. The face ages in three ways – the skin ages, the skin falls with gravity, and we lose volume. To make someone really look good, the doctor has to address all three. How often do you see a women with a 25-year old neck and 70-year old skin? It just doesn’t make any sense. No one machine or non-surgical procedure can address this. Non-surgical procedures do not tighten skin, at least not in the long term. You may be able to get a marginally beneficial effect for a few months during the healing process. However, these treatments are expensive, come with their own side effect profile, can be painful, and are often done by people that are not trained to do real procedures. If you are not a surgeon, you will look for any way to do facial rejuvenation that does not involve surgery. I am not saying that every patient needs surgery; in fact, quite the contrary. However, certain things do. For example, if your neck is loose, no machine, laser, peel, pill, magic water, etc is going to tighten it. Many plastic surgeons and dermatologists are also heavily promoting the so-called “liquid lift”. Can a true lifting effect be achieved via injections of botox and fillers? There is a lot of confusion for patients. Botox is used to treat wrinkles that you get from moving your face during normal conversation. It does this by weakening the muscles. Fillers are used to “fill” wrinkles or to add volume to parts of the face. I’ve never been a big believer that fillers can lift the face. Think about it. How can something injected under the skin move the face north and work against gravity? Filler can create projection, meaning it can give the appearance of more volume, but it won’t actually lift skin. Botox has become as common as a visit to the facialist. Do these patients who worry about the fact that in the end it is a toxin, have a valid reason to question it? is there any knowledge of any possible long-term negative effects? Are there any alternatives to create similar results? The short answer is no. Botox is the most common non-surgical procedure and has been used for a long time in millions of patients. If used incorrectly, it can cause short-term issues. No long-term side effects have been reported to my knowledge. When we age, gravity works its way across the board, and the gap between biplane and nose widens, hence lip lifts being the latest buzz. Your take on it? I have never been a fan of the lip lift. Although the procedure does a wonderful job at lifting the lip, it also involves a scar at the base of the nose. If this scar does not heal absolutely perfectly, it is noticeable to every person that looks at your face. Unfortunately the upper lip gets longer and flatter as we age. Fillers are a great alternative that does not involve a scar. As the new editor, my focus is on my specialty – rhinoplasty. The Aesthetic Surgery Journal is the most prestigious and widely-read journal about Aesthetic Plastic Surgery in the world. Because of this, plastic Surgeons from around the globe submit new and innovative research. My job is to read these articles as well as the opinions of our independent review board. Based on their opinions as well as my own analysis, certain articles are chosen for publication. Also, from time to time I submit my own original articles and ask for invited commentaries from experts in the field. Overall I am super excited to be on the forefront of rhinoplasty surgery. Plastic surgery in the U.S. can be pricey and, as a result, there is whole industry that caters to people who seek cheap but good surgery in other countries where the price is much more affordable – such as South America or Asia. Is this smart or short-sighted? I think it can be very shortsighted. Not to say there aren’t any good doctors in other countries. On the contrary, many great physicians come from other countries. However, the average consumer of aesthetic services does not know who these doctors are or where to find them. In other countries, the standards are usually not as high when it comes to quality, infection control, postoperative care, etc. In fact, in Southern California I have taken care of a large number of patients who went to Mexico and Asia for surgery only to come back with issues that sometimes can take months to heal from. I can remember a pair of sisters that had mineral oil injected into their buttocks in Tijuana. Both died as a result after years of horrible infections, the inability to walk, and finally sepsis. While we love to use the term “timeless beauty”, the concept of the “ideal beauty” is constantly changing. What is the current most-desired look and do you feel it’s here to stay? Which celebrities do your patients often idolize, and which body part do they want of theirs? People show me all kinds of things every day. Some are really pretty and some can be quite strange. The key to making people happy is understanding what they want and then setting realistic expectations. Also, I see a lot of patients of different ethnicities – Latin, Asian, Mediterranean, etc. These patients also need to be clear about what they are looking for. Some are looking to keep their ethnic traits and some want to complete abandon them. There are some celebrities who come up again and again – for example, a lot of patient show me Emily Rajtakowski’s breasts. Women seem to love her full, yet natural look. By natural, I mean no unnatural fullness in the upper part of the breast. I see all kinds of noses and they usually come from women on Instagram. The one thing I can say is that all people have their own unique set of preferences and my job is to help patients to paint a clear picture of their desires so I can visualize them and produce with surgery. We all know that a healthy body is always the one that is the most beautiful. Which foods do you recommend to enhance your beauty from the inside? Acai is a Brazilian berry that I have included in my diet for over 15 years. The Brazilians are on to something. Eat a handful of almonds every day as they are packed with energy, non-saturated fat and goodness. I love my job because I get “wins” every day. Every day I am seeing new patients who want surgery, doing surgery, and/or seeing patients after. That means every day I see happy people whose lives I have touched. love that and couldn’t imagine doing anything else. Watching people walk out of my office with confidence and a smile on their face gives me all the satisfaction in the world.